As of March 2009, the Market Conditions Addendum to the Appraisal Report required appraisers to research and analyze the general market conditions. In September 2011, Fannie Mae mandated that appraisers employ the Uniform Appraisal Dataset (UAD) as part of the URAR form. The goal was to standardize information supplied by the appraisers on the forms, especially as to descriptions of quality and condition of the subject property and comparable sales. Another directive was that whenever adjustments are made to an appraisal for the year the dwelling was built (actual age) vs. the effective age, the appraiser must provide an explanation for the adjustments. Finally, Fannie Mae also dictated that the proximity of comparable sales to the subject must be stated in miles and include the "applicable directional indicator". Many of these changes were a result of the Dodd-Frank Wall Street Reform and Consumer Protection Act of 2010 (Dodd-Frank Act). The UAD is a significant change on the URAR form that could create more liability for appraisers. Instead of vaguely stating the property is in "average" condition, appraisers must select the UAD code which reflects the condition of the property as defined by Fannie Mae. By having to select a unique code with a specific definition, any adjustments made for the selection of a different code for the comparable could be a minefield mainly because of the preciseness of the code. Let's say, for example, the appraiser decides that the subject property's condition falls under C2, i.e., the improvements feature no deferred maintenance, little or no physical depreciation, and require no repairs. However, the appraiser then notes that Comp 1 condition is C3, i.e., the improvements are well maintained and feature limited physical depreciation due to normal wear and tear. Let's also say the appraiser makes a $50,000 adjustment to reflect these differences. The report should explain this adjustment and the work file should provide support for this adjustment...perhaps paired sales, or other appraisals reflecting similar adjustments of property in that approximate location. Adjustments now must be precise and must be fully supported by specific numbers to avoid USPAP violations. If the subject report ends up in a lawsuit, testifying that the $50,000 adjustment between the subject's C2 condition and Comp 1's C3 condition is based on your "experience" or on vague "market conditions" will likely not be enough to convince a judge or jury. The definition of each UAD code is too precise; your adjustments have to be just as precise and have to be consistent within that neighborhood and for similar housing. Another issue that we often see is some appraisers are still using Fannie Mae/Freddie Mac URAR forms for private party work. The 2005 URAR form is only to be used for federally-related financial transactions. The untouchable boilerplate language set forth in the limiting conditions, assumptions and certifications refers specifically to "the lender". 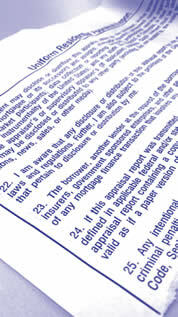 The appraiser using this form for other purposes such as divorce, tax reductions, estate appraisals, etc., is risking liability for creating a report that is misleading to the reader. This is especially important if your report is submitted to your state licensing board in conjunction with a complaint, and we have seen discipline imposed as a result. It is the continuing responsibility of every appraiser to keep current as to new developments, including which forms to use in connection with which assignments and how to best convey all necessary information about the property that is being appraised so as to assist the client with whatever decision is being made. You should check with your software company or your state licensing board for residential forms for non-federally related transactions. Ignorance is not bliss; ignorance leads to missteps, which lead to liability. In a 2009 IL matter the insured did 4 appraisals of condo units that were all being purchased by the same buyer for investment purposes. The buyer had purchased numerous investment properties from the seller/developer in the past. Although the buyer was a licensed real estate agent/broker he did no investigation regarding market value before agreeing to purchase the 4 units. This was despite the fact that the buyer named himself as a broker for these deals and took a commission on each sale. 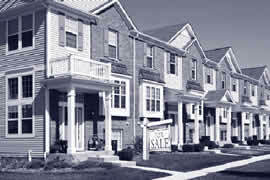 The buyer waited for a few months after the purchases closed escrow before he even tried to start looking for renters. The search to find qualified renters was not going well, so the buyer decided to see if he could list and sell some of the units. The buyer claimed that he discovered the local market had been "flooded" with higher end condo units thereby causing a drop in value for all such units. The buyer never listed any of the units for sale. He simply stopped making his loan payments and allowed all of his loans to go into default. He then sued the seller/developer and the appraiser claiming they had misrepresented the "true" value of the condo units in 2009. In the complaint the buyer stated that he had relied upon the representations made to him by the seller. He went on to say that he thought he could believe the information relayed to him by the seller due to their history of successful dealings. When the buyer/plaintiff was deposed, he testified that he had never seen the appraisal reports until months after his purchases closed escrow. He said, again, that he had relied on the information provided to him by the seller. He "assumed" the appraisal reports came in "high enough" because he had no problems with getting his financing. He was not too concerned about the appraisals because he "trusted" the seller when he was told that the condos were a "good deal". After discovery was completed, defense counsel filed a motion for summary judgment arguing that the plaintiff's cause of action for negligent misrepresentation had to be dismissed because plaintiff admitted he had not relied upon the appraisal reports. Defense counsel attached parts of the plaintiff's deposition testimony to the motion. In his opposition to the motion, plaintiff's counsel argued that Certification #23 should be controlling. Plaintiff's counsel said that Certification #23 was an "admission" by the appraiser that the borrower could rely on the appraisal. As a result, counsel argued that the motion for summary judgment had to be denied. Defense counsel responded by reminding the judge that the plaintiff had admitted in his deposition, under oath, that he had never seen the appraisal reports and had never read the reports prior to his purchase. As a result, counsel said it really did not matter what Certification #23 provided. Unfortunately the judge sided with the plaintiff and denied the motion. He reasoned that the language in Certification #23 gave plaintiff the "right" to rely on the appraisal and it was for a jury to decide whether or not that reliance actually took place. The case is still pending and the "lack of reliance" argument can be made again at trial; however, the presence of Certification #23 means the case will be far more expensive to defend than it would have been if the motion had been granted. We had a much more favorable result in a FL case where a motion for summary judgment was granted, due in large part to language included by the appraiser in his report. The sellers bought the subject property in August 2007 for $700,000. They did some remodeling and rehab work and sold the property to the buyers/plaintiffs in December 2009 for $800,000. The insured did the appraisal for that purchase and estimated value to be $805,000. In the report the insured noted that the appraisal "was not a home inspection and should not be relied upon, by any party, to disclose conditions in the property that are either apparent or latent." In late 2010, the buyers sued the sellers, the real estate agents, the appraiser and the home inspector claiming they had all failed to discover and disclose significant defects including a water intrusion problem that caused mold in the home. They alleged damages for the cost to repair, the diminution in value and also for bodily injury suffered as a result of their exposure to mold. After the completion of discovery, defense counsel filed a motion for summary judgment. There is case law in FL that holds an appraiser owes no duty to the borrower. In addition, the motion argued that the buyers could not rely on the appraisal to report on the condition of the property due to the specific language noted by the appraiser. In their opposition to the motion, counsel for the borrowers argued that his clients did rely on the appraisal. They assumed that there were no problems with the property because they understood the lender would not have approved the loan if the appraisal had disclosed serious problems. Since the loan was approved, the buyers were justified in thinking the appraisal had said nothing derogatory about either the property value or the property condition. The judge in this case granted the motion and the appraiser was dismissed from the lawsuit. The judge said there was no way the plaintiffs could "reasonably" claim to have relied on the appraisal when it clearly was not prepared to comment on the condition of the property. It made no sense to think that was the purpose of the appraisal. 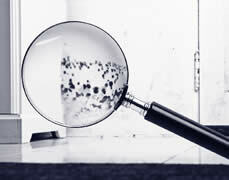 Further, if the buyers truly thought that to be the case then why did they hire the home inspector? The judge went on to further state that the language which was included in the report made it quite clear that the appraisal report was not prepared to disclose property condition. Even if the buyers had the mistaken idea that researching the property condition was part of the appraiser's duties, they should have abandoned that thinking after reading the report.